This cake is so delightful. 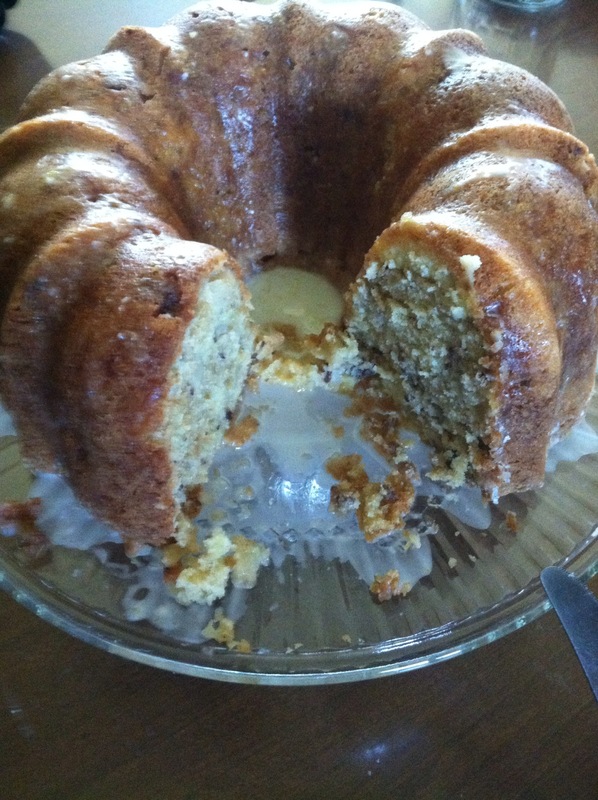 Recipe made by me – I love baking!!! It has a good pecan crunch with warm apples and a nice sugary glaze to top it all off. 1. Mix sugar, oil, and eggs together with a mixer. Mix flour, salt, and baking soda in a different bowl, then mix in increments into the sugar mixture. 2. Take off stand and add vanilla, apples, pecans, 2 lemons worth of zest, and 2 lemons worth of juice. Mix together by hand with spatula until combined. 3. Butter and flour a bunt cake pan. (tip: make a pat of butter soft by leaving it on the counter or barely heating in the microwave and use your hands to get it in the crevices) Bake at 325 degrees for 1 hour and 20 minutes. 4. When cooled in pan, turn out upside down onto cake holder/preserver. Take some zest from a lemon and juice and mix in confectioners sugar – if not runny, add water until at consistency of your liking. Pour over cake. Posted on August 14, 2014 September 26, 2016 by MichellePosted in RecipesTagged apple, bunt cake, lemon, yellow cake.